Spiral Knights: Acceleration or Sin? Today I established landmarks of a different sort. First of all, I finally took up someone’s invitation to a stoked Basil. This ended up working out, even though I sold quite a bit of crystal energy to get enough crowns to buy multiple 4-star item recipes, like the Heavy Demo Suit and the Freezing Atomizer, the latter of which has come incredibly handy during both partying and solo. I then bought an Ash-Tail Coat recipe off of another person with my first Crystal Energy trade, which also worked out, so now I’ve got the set. Also, when running around in the Ash-Tail Coat, I leave little curly trails of smoke behind me. And then, just to finish off the night, I bought the Master Blast Bomb recipe from Kozma. I’ve discovered the joys of knockback during solo, although it’s rather too chaotic for my friends. We’re not the greatest players in the world, though I’ve noticed we’re starting to die less and less in Tier 2. 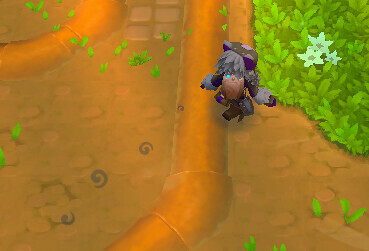 I even managed to deal with the U-turn of gun puppies and generating monsters in Jade Tangle by myself without dying, and ending with most of my health. Note: my strategy to that area is charging up Khorovod, killing one puppy by sneaking up on it, and then running awaaaay until the rest stop shooting bullets at me. Rinse and repeat. They’re quite approachable if you don’t stray too close, and hitting them from the back with Khorovod destroys them in one hit, maybe two, in Tier 2. Also watch the gun puppy animation; they always seem to take a breath before delivering the next volley, a short time in which they’re vulnerable. Shield after one or two hits, in case it isn’t dead yet. As for the lumber and wolvers that generate, I was able to clear them with a combination of the Freezing Atomizer and due application of Khorovod. 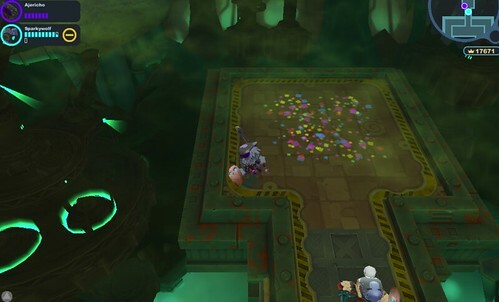 A picture: a Clockworks level in the poison stratum. I now have a strategy for dealing with retrodes: let them gather around me, kiting them into doing so while shielding, and then slam them with Khorovod after they slash. If they’re close by, they don’t do their laser-eye thing, which is quite a relief. Even though you’re close to them. At times I handle Khorovod like a ranged weapon. This works out quite well since I have extra time to shield as the enemy comes after me. Spiral Knights: teaching me the patience of counterstrike. It’s not shameful to hold back and apply strategy instead of going all out, which is asking for trouble. Hmmm. Well, after tonight, my crystal energy reserves are hurting, but to heck with it. I mostly like being able to beat up things for cash and heat. Someday I might too find 4* recipes to sell, or maybe Basil access that’s decent, but I suspect that I would have spent this much energy trying to find the recipes that I did through player interaction. And as Spiral Knights is indeed an MMORPG, I suppose I’m fine with this, although I’m not going to be doing it again for a good long time—that is, until next month. I’m really enjoying your blog Ajericho… I’ve never blogged about anything (even though I’ve always wanted to…) but this blog is just fantastic. I just joined Spiral Knights yesterday and it really is a lot of fun. Looking forward to seeing you in game perhaps! Cheers! Thanks! I’m glad you’re enjoying my posts. :) Have fun in the clockworks, and perhaps we’ll meet! I’ve just recently started playing Spiral Knights, and I’m using Troika at the moment… I enjoy reading your posts on how you use Khorovod, since that entire series doesn’t seem to be very popular. I really like the concept of the heavy stun+knockback sword, but it takes some getting used to in order to use effectively. I’m still getting used to properly timing attacks with it. Yep, Khorovod requires good timing and knowledge of its reach. And I shield often while using it; the first swing is so powerful, I don’t go with the second unless I know the enemy is going to be finished (and even then, I can always be surprised by hidden menders). Glad you enjoy the posts!